A festive breakfast has to be palappom. This is what you will be served if you are at my home for breakfast. There is a special wok that is used to make this, however, since I don't have one right now I decided to improvise. I tried my own version in a regular pan and it tasted just fine even though the pretty look was missing. I decided since most of you won't have the wok it maybe a good idea to tell you, you can make this in a shallow pan. When the edges start leaving the pan appam is ready. Gently lift it off the pan. There is no need to flip the appam. Make sure by touching carefully on the inside of the appam. If it does not stick then its done. Heat oil in a pan and add the cummin. Add all the vegetables and stir in well. Cook for one whistle and switch off the stove and let it stand for 5 to 10 minutes till all the pressure has escaped. 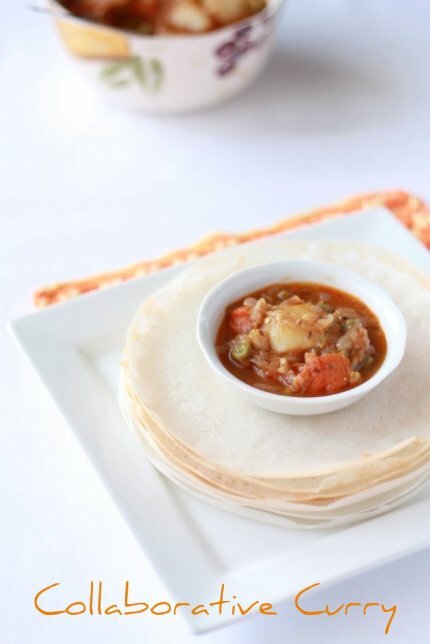 Traditionally appam is served with stew made of vegetables, chicken or lamb. Beautiful pictures. I've always wanted to try making this so now I've read your wonderful recipe I have no excuses! I love all of these breakfasts that are so new-to-me! They all look so delicious. I've never seen appam! I can't believe you got it to be so thin, thinner than a crepe! Looks delicious! Apom i love, reminds me of weekend when mom used to make them for breakfast , as we kids had much more time to enjoy the brekfast. Have to admit till now i have never made them at home. 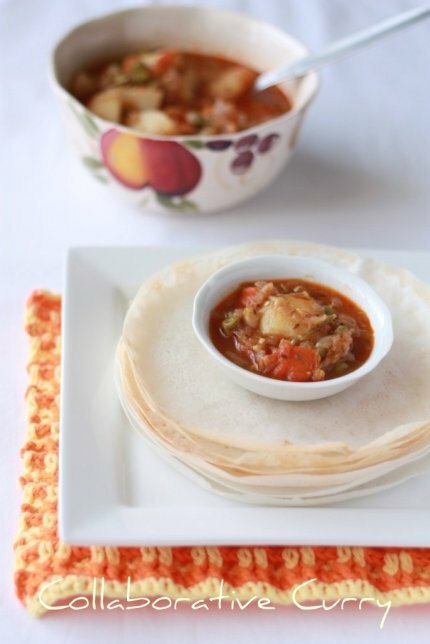 I love appams with vegetable stew. I sometime request a friend to make these for me. thats a wholesome breakfast/brunch option. now that you have shared the recipe will try it myself too. nice presentation and very temting appams. What a glorious looking dish...one of my all-time favorites...love palappam, dear...you have the most dreamy looking pictures there!!! would love to grab all those appamswhich look so tempting and inviting. Ur recipe is different for pallapam, looks gorgeous ! New to me..looks so beautiful and yummy..got to try soon..pics look great too..
Looks so very delectable. The Appam looks like its made of air..looks so fluffy and perfect like a full moon. I can't stop drooling at it. Great shots. I was looking forward to this...before I left delhi, Apam had become a craze in my house...I tried onces in a hurry,,,it was just bad. will tell some one to try this...the cuury is very nice , and the photos too. This is very new to me...looks absolutely gorgeous!!!! It's new to me. But I can tell this dish is a labour of love. This is one of my hubby's first choice for bf or dinner but i havent tried yet.He ia in Delhi for some offical work and ll be back in a week.I am gonna surprize him by making this. Beautiful pictures. Appam looks so soft and fluffy. Appam with kurma is the best combo. Mmmmmm picture perfect click...looks mouthwatering. Wow! That is amazing that you made appam from scratch. The curry sounds delicious too. Beautiful photos! I have just aquired an appan pan so I will surely try this recipe.Beautiful clicks as always. J'aimerai bien essayer cette recette. Never tried it with basmati rice. Looks really good. I think I can come over there for breakfast :) Appam look very soft...must have tasted really good with the curry! I would love those light and delicious appam for my breakfast, yum! never thought of making appam in a shallow pan.. would definitely be helpful for people who don't have the proper appachatti... and should I say "Wonderful clicks" again!!! Appam in Basmati rice is totally new to me. Appam looks soft with delicious curry. Neatly presented....cant wait to try aapam in basmati rice! your appam looks so perfect! I haven't had this for more than 10 years now! soft yummyy and perfect palappam..
Bookmarked ! 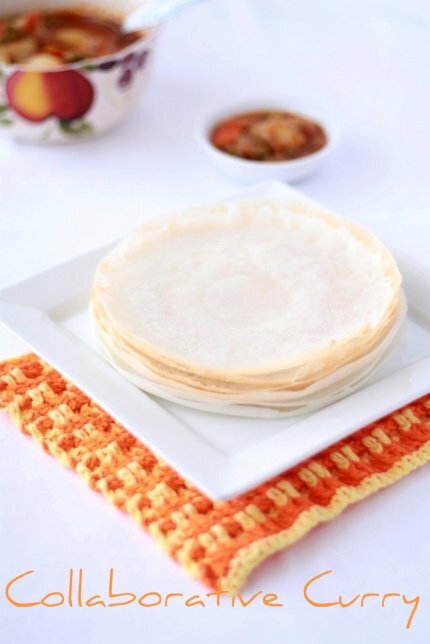 Always wanted Appams recipe , thanks for sharing ! Nice presentation!! !looks really tempting yaar! Nicely presented and beautiful pic..
vayyil vellam vannu njan erakkipoyyi..:P.luks awesome.Pic is perfect. I have never heard of this before but it looks wonderful! Amazing clicks and very well presented. Love your presentation. So beautiful as always! Tks for the visit and ur lovely comments! Really appreciate that! U've got a wonderful space with beautiful shots and recipes! WOW! very new to me.. stunning pics..
i just love that click, lovely presentation! Beautiful presentaion! healthy and filling breakfast! mmm the appams are looking very thin... Nice presentation, lovely pics!!! I can never get also fine, have a very bad philps mixer :-( can i use rice flour?